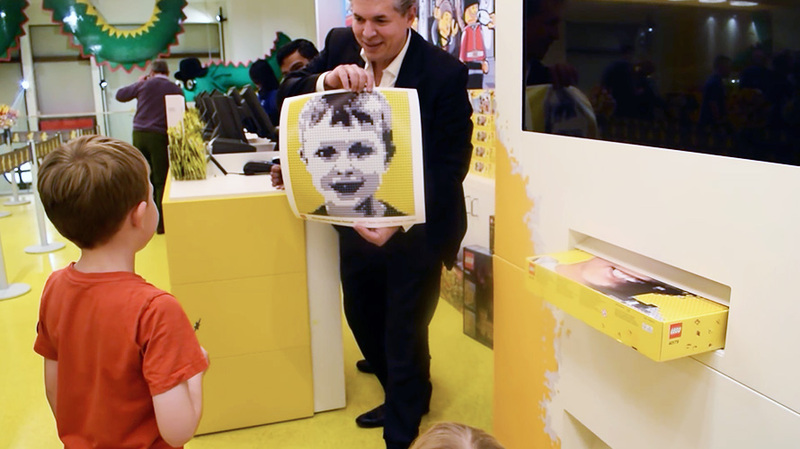 If you’ve always dreamed of creating a self-portrait out of Lego bricks, rejoice! A nifty machine at the toy maker’s London store can finally set you on that path. Just head over to Leicester Square and climb into the “Mosaic Maker,” a cross between an instant photo booth and a Lego vending machine. For the equivalent of about $125, it will snap your headshot, render the image into a five-color poster, and spit out the set of bricks you’ll need to recreate your own visage. It’s not quite as magical as it might seem. The portrait kit is pre-boxed with 4,502 pieces—you’ll use 2,304 of them to assemble your Lego portrait. It’s still pretty clever, though. The poster serves as a roadmap to recreating your photo, and the booth is made out of Legos, which heightens the sense of play. That puts it right at home in the giant, spectacle-laden store (Lego’s largest), which opened last fall and also features outsized Lego replicas of Big Ben and a train car from the London Underground. The result itself, a simple pixelated but generally accurate representation, is vaguely reminiscent of a Chuck Close work, if his medium were reduced to a bunch of little black, white, yellow and gray (two shades) plastic chips. Conceptually, it’s a good fit for the social age, when it’s easy to imagine superfans of the brand not only spending the three hours or so required to assemble the portrait, but sharing it—the world’s most laborious analog selfie—online. Maybe even making it a profile picture. Would-be Lego narcissists beware, though. You’ll get only three shots in the booth to nail that perfect pretty smile.